Through a series of sure-footed moves, Iger has worked tirelessly to position Disney as the world's preeminent entertainment company. Now he is closer to realizing his vision as the Burbank giant late Tuesday finalized its $71.3-billion purchase of much of Rupert Murdoch's 21st Century Fox. The acquisition is the boldest — and riskiest — of Iger's 14-year stewardship of Disney. It's the culmination of an expansionist strategy that has guided Iger as he has transformed the storied company through a series of takeovers that made Disney the home of "Star Wars," "Black Panther" and "Incredibles 2." 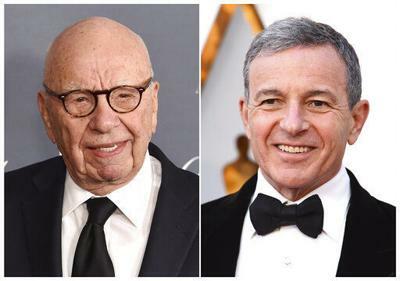 With the landmark purchase of Fox assets, Disney, already valued at $168 billion, is poised to be an even bigger force in Hollywood. Disney is taking over Fox's movie and TV production studios and the rights to such valuable properties as "Avatar," "Ice Age," "Modern Family" and "The Simpsons." The owner of ESPN and ABC also scoops up the FX and National Geographic channels, a controlling stake in streaming service Hulu and Fox's international television portfolio.